Nicolas Cage - A Knighthood from Camelot Castle - England? A Knighthood for Nicolas Cage? An Historic Meeting at Camelot Castle, England. "Sir Nicolas Cage of Camelot?" I have put his name forward for consideration for full investiture as a Knight of Creativity of Camelot Castle. A Knighthood for Nicolas Cage? An Historic meeting at Camelot Castle. Mr. Cage is currently up for consideration for investiture as a "Knight of Camelot Castle". 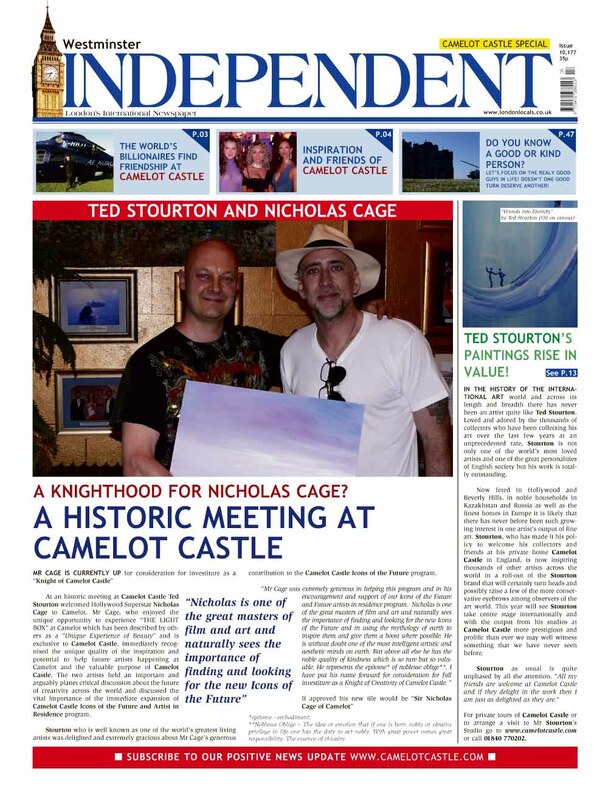 At an historic meeting at Camelot Castle Ted Stourton welcomed Hollywood Superstar Nicolas Cage to Camelot. 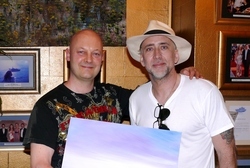 Mr Cage, who enjoyed the unique opportunity to experience "THE LIGHT BOX" at Camelot which has been described by others as a "Unique Experience of Beauty" and is exclusive to Camelot Castle, immediately recognised the unique quality of the inspiration and potential to help future artists happening at Camelot and the valuable purpose of Camelot Castle. The two artists held an important and arguably planet critical discussion about the future of creativity across the world and discussed the vital importance of the immediate expansion of Camelot Castle Icons of the Future and Artist in Residence program. Stourton who is well known as one of the world's greatest living artists was delighted and extremely gracious about Mr Cage's generous contribution to the Camelot Castle Icons of the Future program. "Mr Cage was extremely generous in helping this program and in his encouragement and support of our Icons of the Future and Future artists in residence program. Nicolas is one of the great masters of film and art and naturally sees the importance of finding and looking for the new Icons of the Future and in using the mythology of earth to inspire them and give them a boost where possible. He is without doubt one of the most intelligent artistic and aesthetic minds on earth. But above all else he has the noble quality of kindness which is so rare but so valuable. He represents the epitome* of noblesse oblige**. " "I have put his name forward for consideration for full investiture as a Knight of Creativity of Camelot Castle." If approved his new tile would be "Sir Nicolas Cage of Camelot". The Icons of the Future program, was founded by John and Irina Mappin and Ted Stourton, it is based at their home at Camelot Castle in Tintagel and helps the new Icon's of the Future, the new artists, the new architects, the new scientists and the new captains of industry around the world emerge and succeed. It can be viewed at http://www.camelotcastle.com. **Noblesse Oblige - The idea or emotion that if one is born nobly or obtains privilege in life one has the duty to act nobly. With great power comes great responsibility. The essence of chivalry.